The course will run from 10:00 to 16:30 on both Saturday and Sunday. The hall will open at 9:30 on Saturday for tea and coffee. On Saturday, you are invited to join us for dinner at a local pub (meal not included in the price of the workshop). 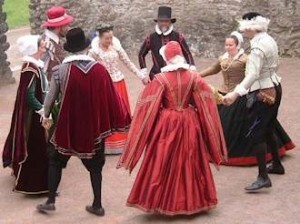 This course is aimed at dancers who are already familiar with the 16th century Italian repertoire and who would like to improve their style and performance technique. Mary Collins, who is one of the UK’s foremost exponents of Early Dance, will lead the course. Mary has advised and choreographed for television, video, dance and theatre companies in addition to directing her own dance group DANSERYE. A founder of the national association for early dance in the UK, the Early Dance Circle, Mary lectures at the Royal Academy of Music in London, Birmingham Conservatoire and the University of Warwick.